We’ve just begun our 10-night Celebrity Cruises Galapagos Island experience after arriving late-evening in Quito on a flight from Miami. It’s been several years since we were in Quito, the last time arriving at the old, mid-town airport. With buildings encroaching on short runways, mountains and volcanoes all around, the old airport was rated as one of the most challenging in the world. Now located on open acres of former cornfields, the new airport boasts longer runways and capacity to meet the ever growing traffic of Latin America. Arriving after 10PM, the drive to the central JW Marriott isn’t much longer than from the old airport. However, later in the week during rush hour, the packed roadways and tunnels can easily add over an hour to transfer times. 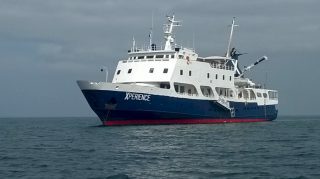 This 10-night trip with 2 pre-cruise nights in Quito, a 7-night Galapagos Islands cruise plus 1 post-cruise night in Quito is the most popular Celebrity Galapagos vacation. Everything is handled except the international flights to Quito. Most meals, overnight accommodations, a full day of touring Quito and the flights to/from the tiny Isla Baltra airport make this a very convenient, inclusive package and the best way to see the Galapagos Islands. 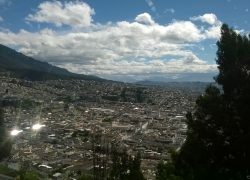 Our first stop on the city tour is the El Panecillo hilltop statue of the Winged Virgin of Quito. Created with over 7000 pieces of aluminum the statue stands on the “bread loaf” hill at 9,900 feet above sea level. 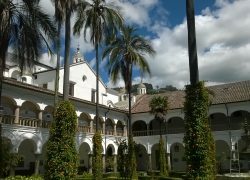 Next, we’re back to the main city to visit the Church and Convent of San Francisco. 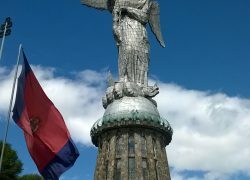 One of the largest historical structures in colonial Latin America. 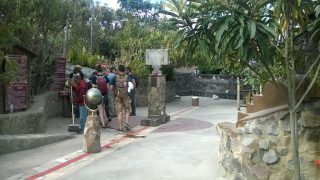 During a delicious lunch our guides tell us about our next destination, the Equator. Located about 15 miles from Quito, the original monument at Middle of the Earth Park stands beside a long yellow stripe marking the center of the earth. The only problem is that with technology of the early 1700’s, they missed the actual Equator by several hundred feet. Now, instead of visiting the Middle of the Earth park, you’ll visit a smaller, somewhat more reserved museum and see live demonstrations of egg balancing and sink draining on each side of the Equator. Returning to the hotel, we have a bit of free time before the welcome dinner at a local restaurant. Tomorrow will be an early morning as we’ll transfer to the airport, then take a short flight to Guayaquil before the 2 hour flight out to Baltra. After clearing the rigorous inspection process at the Baltra airport (to prevent the introduction of outside insects or plant life to the Galapagos) we relax in the VIP lounge before being shuttled the short distance to the Baltra pier where our zodiacs or pangas await our arrival. Donning life jackets in what will become a routine, we’re quickly onboard the Celebrity Xperience, our new home-away-from-home for the next 8 days. Baltra, Celebrity Xperience, Galapagos Islands, Quito. Bookmark.